It was built during Ayutthaya period, originally called "Wat Bangwayai". "Rakhang" mean temple bell. During the reign of King Rama I, when a bell was found in the temple compound. Later, King Rama II had this moved to Wat Phra Kaew, and replace five new temple bells at the compound. 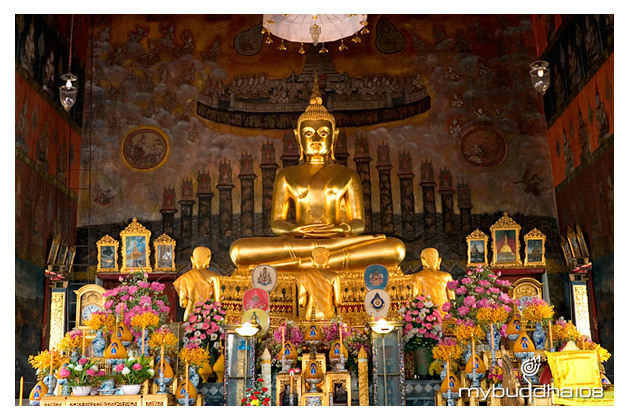 It is the residence of Somdej Phra Phuthtajarn Toh Phramarangsi (Somdej Toh), Chairman of the Ecclesiastical Council who has been well-known of this practices. Ubosot house the principal Buddha image name "Smiling Principal Buddha" by King Rama V.
To pay homage to Somdej Phra Phutthajarn Toh Phramarangsi is to pray religious verse called "Jinabunchon", place incense sticks into the incense burner, gild the buddha image, sprinkle with holy water for good luck before paying respect to the principal Buddha image in Ubosot.